SAVANNAH, Ga. – After wrapping up a successful Christmas tree recycling program last week, the U.S. Army Corps of Engineers Savannah District welcomes anglers to take advantage of about 1,500 used Christmas trees now available for use as fish attractors at select boat ramps on J. Strom Thurmond Lake (Clarks Hill, S.C.). Last week Corps park rangers and volunteers transported the trees from the community drop-off site at Riverside Middle School (in Evans, Ga.) and distributed them at select boat ramps surrounding Thurmond Lake for anglers to use. Submerging trees near private docks or private facilities is strictly prohibited. Boyd and his team also plan to submerge some of the Christmas trees at various fishing locations throughout the lake, pending weather conditions and lake advisories. For a list of GPS coordinates to locate these placed trees, contact the Thurmond Project Office at 1-800-533-3478. 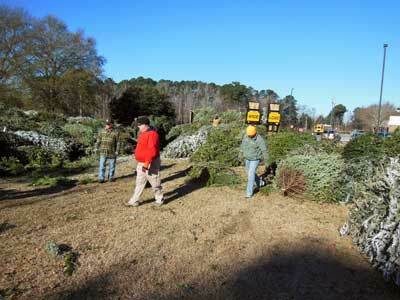 For questions or additional information about the tree recycling program, contact Ken Boyd at 864-333-1159.